No shade to coconut oil, but we hear about it all the time as a coveted oil with many skin, hair, and health benefits. However, besides coconut oil, lots of beautiful and amazing homegrown things from the earth can be beneficial to us in a multitude of ways. Example? Lavender oil. This pretty, purple plant has powerful benefits. Some studies have shown it's even an effective treatment for medical conditions dealing with neurological disorders of the nervous system, while others have also shown that lavender essential oil can help with insomnia, hair loss, anxiety, stress, and postoperative pain. The hardworking herb comes in many forms, so we talked to holistic skincare expert Mariska Nicholson, who is the founder of Olive + M, an ethical and all-natural skincare line, about how to navigate the lavender oil pool. "Not all lavender is created equal," says Nicholson. "The kinds that can be found at many drugstores and grocery stores are made with low-grade oils that aren't pure or have been diluted with fillers and synthetic ingredients. Be sure to do your research." Fortunately, Nicholson pointed out the major difference between types of lavender oils that are important to be aware of. "There's a difference between lavender essential oil or lavender oil. If a label does not clearly state that it is an 'essential oil,' then it is not an essential oil and should not be used or treated as such. Lavender oils are simply perfume oils that are unlikely to contain any beneficial properties that are found in lavender essential oils. Lavender oil is not even derived from a lavender plant." Just to give you an idea of the volume of the herb on the market, "There are over 40 species of lavender discovered to date and over 400 varieties," says NIcholson. "These have been cultivated to yield different types of lavender essential oils. 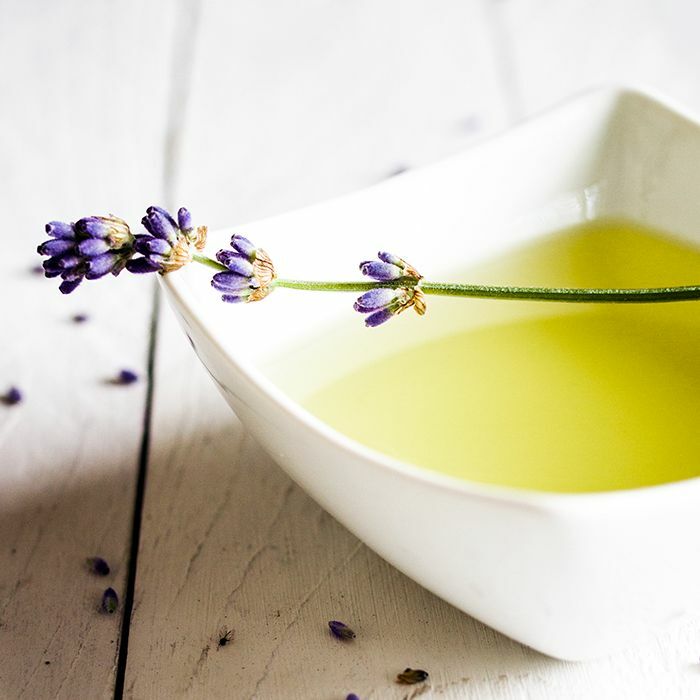 These different kinds of lavender produce oils with differing chemical compositions, resulting in essential oils that can be more suitable for particular issues than others." To determine the authenticity of an oil or company, Nicholson suggests looking at the pricing of lavender essential oils—if it's cheap, it's safe to say it's probably low-grade or diluted by production and manufacturing practices used by the company. "Therapeutic grade does not mean an oil is safe, pure, ingestible," warns Nicholson. "There is no 'FDA' of essential oils, meaning there is no regulation, process, or requirements to label or market an essential oil as 'therapeutic grade.'" Lavender (or Lavandula angustifolia) is a favorite essential oil of many for its versatility. "It has a relaxing effect on the body, and therapeutic-grade lavender has been highly regarded for the skin," explains Nicholson. Read on for all the benefits of lavender oil you'll love. According to Nicholson, here are 15 ways you can benefit from lavender oil. Nervous System: Studies show the inhalation of lavender has a soothing and calming effect on the nervous system, making it a great alternative for alleviating stress, anxiety, depression, and fatigue. Nausea: Studies have demonstrated that inhaling lavender scent can relieve feelings of nausea or motion sickness. Headaches: Recent research says that inhaling lavender scent or massaging the oil into the temples, forehead, and neck (specifically behind your ears) can treat headaches. Sleep: Adding a few drops of lavender oil to a diffuser next to you bed at night can help relax the mind and the body and improve your overall sleep. Wounds: Applying a dilution of lavender oil and distilled water to a wound can help stimulate cell regeneration and heal the wound faster. Menstrual Cramps: Applying lavender oil to the abdomen during your menstrual cycle can help alleviate cramping. Skin Food: Lavender is packed with antioxidants that protect and nourish your skin, making it a perfect addition to any skincare formula. Chapped Lips: I love mixing lavender oil with coconut oil for the perfect lip balm to relieve chapped lips. Cold Sores: Lavender's antimicrobial and antifungal properties make it an excellent choice to combat a cold sore. Acne: Lavender is antimicrobial and antibacterial. so it can be used to treat an acne flare-up or keep it at bay. Sunspots: Consistently using an oil with lavender in the formula can minimize the appearance of sunspots. Itchy Skin: Lavender is an anti-inflammatory, so it can be used to relieve inflamed and itchy skin caused by eczema or insect bites. Dandruff: I tell people to mix lavender with olive oil and massage it into the scalp to get rid of dandruff and other scalp imbalances. Hair Growth: Lavender also stimulates blood circulation, so it can greatly improve hair growth when applied to the scalp in an olive oil mixture. Fragrance: Lavender has a delightful floral yet clean scent, so using it as a fragrance is a great natural choice. Warning: Some internet sources may tell you that lavender oil in your mascara promotes lash growth with strengthening, volumizing, and lengthening lashes, but according to Nicholson, this is not true. "Do not use undiluted lavender oil near your eye," says Nicholson. "There is no evidence to back up these claims. Even diluted is not encouraged." Ed. note: Check with your doctor before using essential oils to treat any medical concerns. While we're on the same wave, find out every cool way to use essential oils and why you need to start now.